SO something has been looming in the back of my mind. I think that I have lost all motivation or perhaps I just do not give a damn? 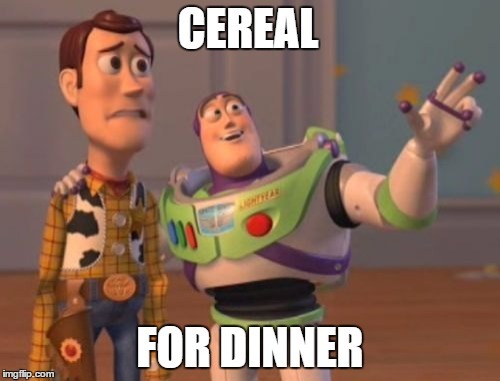 Dinner = cereal most nights. I hate going to the store with a fiery passion. Throw the whole, “why would I put myself through that for cooking for ME.” Cereal is always there, it understands. It is simple and you know what? Always seems to there when in need haha. I suppose at my age, I should be more open to cooking – due to health concerns and I suppose the little fact that I am in my late 20s…ahem. I used to love cooking and especially baking. Not so much anymore EH. Makeup? I used to NEVER leave my house without foundation. My rosacea has haunted me for most of my years and suffocating my skin with some sort of corrector or thick foundation seemed like the only way I could face the world – pun intended. I would never even think about stepping outside the house rosy cheeks openly exposed. Now, I may put on makeup MID day and only if I am feeling spry. I let the rosy cheeks fly, more so since my dermatologist reminded me to let my skin breathe haha. So MAYBE the thickest coverup is not the best solution to my problem. EH what does he know anyway… So I have kept with my regiment (mostly) and I can tell a difference when I am on my game. I basically only stick to moisturizers now? I forced my self to Ulta last Sunday. I am going to TRY to look more human, I suppose. IT Cosmetics has a FANTASTIC CC cream that is easy to apply (WIN FOR THE LAZY GIRLS!) and covers decently. So, here is to me trying to look more socially acceptable each morning (I am so sorry coworkers haha) AND hopefully maintaining a more constant brow game. I will follow up on that later haha. Odds are…. this will be difficult. The snooze button and I are bffs…like peanut butter and jelly status. Clothes… I am a bare minimum gal. Mostly, I am not great at fashion and I would rather be cozy than uncomfortable. I wish I was a trendy kind of gal sometimes, who effortlessly struts in her heels, hair flying/shining beautifully in the wind, well flawless outfit and THE perfect nails. But me? Oh, I am more of the girl tripping on flat ground, hair flying in an angry tornado TRYING to suffocate &/or choke on me #longhairprobs. I will say though – while I may be plain in 99.9% of my outfit, there is a good chance that I have awesome socks – take that world! It has got me far in life… er perhaps its the little things in life that keeps me going? MEH. Hobbies….where have you gone? Let’s meet back up shall we, you bring the coffee. SO thre you have it. Perhaps I am just a lazy gal but I would love to hear your thoughts! Are you a lazy gal like me!? Or shall we call it, getting older and not giving AF at the ripe age of 29ish? Much love to everyone, I hope you have a great day tomorrow!